The Irish group will bow out following a farewell tour next year and said they are looking forward to "new ventures". Over the course of their career the group has achieved 14 number one hits. 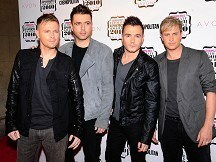 In a statement the group said: "Over the years Westlife has become so much more to us than just a band. Westlife are a family." The group - for many years managed by Louis Walsh - survived the departure of one of its founding members Bryan McFadden, and continue seamlessly as a four-piece. Singer Mark Feehily also won admiration for announcing he was gay when the boy band were at the peak of their success. They produced hit after hit, with singles such as Swear It Again and Flying Without Wings among their number ones. Many of their big hits over the years were cover versions and they capitalised on a swing revival by recording a Rat Pack-style album Allow Us To Be Frank. Members Feehily, Kian Egan, Shane Filan and Nicky Byrne are due to release a greatest hits album shortly. They said they had "countless memories that we will forever cherish" from their years together.